Grow With Colours, the latest literature from Eurocell, showcases the wealth of possibilities offered by its enhanced range of coloured profiles across market-leading products; including Modus and Eurologik doors and windows, Charisma vertical sliding sash windows, Euroslide patio doors, Skypod skylights and conservatory roofs. The company – the UK’s premier supplier of high performance doors, windows and glazing systems – has expanded its standard range to include exciting new colours such as Anteak and Cream White as well as the enduring Cream, Rosewood and Anthracite Grey – all available from stock. Even greater choice is available with the Made to Order range, which offers up to 32 options with a lead-time of only three weeks. 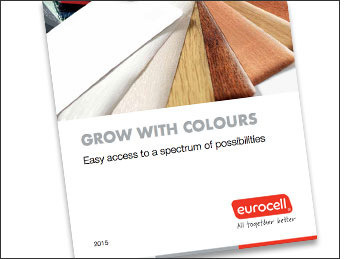 Whether the client requires the natural appearance of woodgrain finishes or cool greys, greens and blues, Eurocell can guarantee colour matching across all its PVC-U products. These include the Eurocell range of external cills and end caps, which are available in three sizes and are colour matched to a wide range of window systems within the industry. Plus, there is a wide range of complementary ancillary products, including decorative add-on products and window finishing trims in foam and rigid options, so that windows and doors can be tailored to meet any requirement. Grow with Colours can be downloaded from the Eurocell website at www.eurocell.co.uk or is available from any one of over 140 Eurocell branches throughout the UK.